There are fats that are necessary, and our bodies are able to create most of them from other fats or raw materials. However, omega-3 fatty acids, also known as essential fats, cannot be created and, therefore, need to be included in our diets. They are a vital part of cell membranes throughout the body and affect their function. They also assist in making the hormones that control blood clotting, and contraction and relaxation of the arteries (2). There are two types of omega-3’s that are found in oily fish, such as salmon and mackerel: DHA (docosahexaeonic acid) and EPA (eicosapetaenoic acid). Both have noted heart-health benefits. Studies amongst Eskimos and the Japanese, both fish-eating cultures, have shown a low rate of heart-related deaths. In Japan, these rates have even been noted to be roughly half of what they are in other western societies. The more fish you consume, the more omega-3 fatty acids you absorb, since our bodies cannot produce them (3). It is important that you get enough EPA and DHA in your diet. Many health organizations recommend getting between 250 to 500 milligrams per day. Wild mackerel have been found to have about 1,500 milligrams in a 3-ounce serving, making them a great choice over other commonly eaten fish, such as tuna and cod (4). Bottom Line: Mackerel are an excellent choice among fish, providing roughly 600% of your daily recommended intake of omega-3 fatty acids. Vitamin K is essential, as it has many benefits for your heart. It is necessary to help your blood clot, which is why it is given to infants at the time of delivery, and can prevent the hardening of your arteries due to calcification, or the build-up of calcium in in the artery linings and body tissues. Vitamin K also aids in building your bones, which can help prevent diseases such as osteoporosis. Like vitamin D, most people are deficient in vitamin K to some degree. We intake enough to help our blood clot properly, but not enough to avoid many other health risks (5). The recommended amount of daily vitamin K depends on your age and gender. For the average adult, men should intake about 120 micrograms per day and women should have roughly 90 micrograms daily (#). The greatest concentration of vitamin K is found in dark, leafy greens (like spinach and kale). So, while mackerel should not be your primary source of vitamin K, as it only offers 8.63% of your daily value per 100 grams, it is a great addition if you are looking for more than just green salad (6). Bottom Line: Even though it shouldn’t be your primary source of vitamin K, mackerel is a great addition to your diet to ensure you are meeting your daily requirements. It’s no doubt that heart disease, include heart attack and stroke, is amongst the most common diseases that ail people in the United States. About one in every four deaths Is heart-related, and over half of them are usually men. About 735,000 Americans have a heart attack every year, and roughly a third of these have already had at least one in the past. While those with high blood pressure and cholesterol contribute to a higher risk of heart disease (about half of people with heart disease have at least one of these risk factors), there are certain lifestyle choices that contribute as well, such as physical inactivity, poor diet, and obesity (7). With improved blood flow, you can lower your blood pressure, prevent cholesterol build-up, and constriction of arteries. It has been found that including fatty acids in your diet can be even more effective at reducing heart-related incidents, such as heart attacks, than most commonly prescribed medications (8). A simple diet change can be the start of reversing your risk of developing heart disease. Including mackerel in your diet improves the condition of your blood, which then promotes better heart health. Both the American Heart Association (AHA) and the American Diabetes Association recommend that you include at least two servings of fish, such as mackerel, in your diet per week (9). Bottom Line: By including mackerel in your weekly meal planning, you can decrease your risk for heart disease. Triglycerides, unlike omega-3 fatty acids, are fats in your blood that your body creates. When you eat, your body takes any calories it doesn’t use right away, turns them into triglycerides, and stores them in your cells. These triglycerides cannot be absorbed in your blood, and are released between meals as energy for your body. If you regularly eat more calories than you burn, you are at risk for high triglyceride levels, which can have potentially negative side effects on your health (10). There are also common diseases or medical conditions that can lead to high triglyceride levels (hypertriglyceridemia). These include diabetes (poorly-controlled), kidney disease, alcoholism, hypothyroidism, liver diseases (such as cirrhosis), and obesity. There are lifestyle changes you can make to cut back on your triglyceride levels, which include diet and exercise. Try trading higher fat (especially saturated fats) foods for healthier monounsaturated fats (like omega-3’s), such as red meat for mackerel (11). Bottom Line: Choose foods that contain healthier fats, such as the omega-3’s in mackerel, if you are at risk for hypertriglyceridemia. Like triglycerides, cholesterol is a fatty-like substance that is found in the cells of your body. Cholesterol is necessary to make hormones and other substances that help you digest your food. It is carried through your bloodstream on lipoproteins, both low-density (LDL – “bad” cholesterol) and high-density (HDL – “good” cholesterol). High LDL levels leads to cholesterol build-up in your arteries (and cholesterol cannot be absorbed into your blood), HDL carries the cholesterol back to the liver, which then removes it from your body (12). Your body makes all the cholesterol it needs, but it can also be found in the foods you eat. As a result, high-cholesterol affects over 30% of adults in the United States alone. While about a third of them have it under control, less than half are seeking treatment for it (13). There are no visible symptoms of high-cholesterol, and only a blood test can determine your levels and if you are at risk. Unchecked, high-cholesterol can lead to issues such as heart attack or stroke (14). Your lifestyle is most likely the cause, but it can also be the result of your age, gender, or an unfortunate family history. By eating a diet high in saturated fats and not exercising, therefore leaving you overweight, you greatly increase your risk of high blood cholesterol (15). The fish oil found in mackerel has been known to lower LDL levels and raise HDL levels. Since oily fish can help lower LDL levels by keeping cholesterol from being absorbed into the intestines, it is also effective at lowering blood pressure (16). Bottom Line: Due to the “good” fats found in mackerel, consuming more can effectively lower your LDL, or “bad”, cholesterol level. 6. 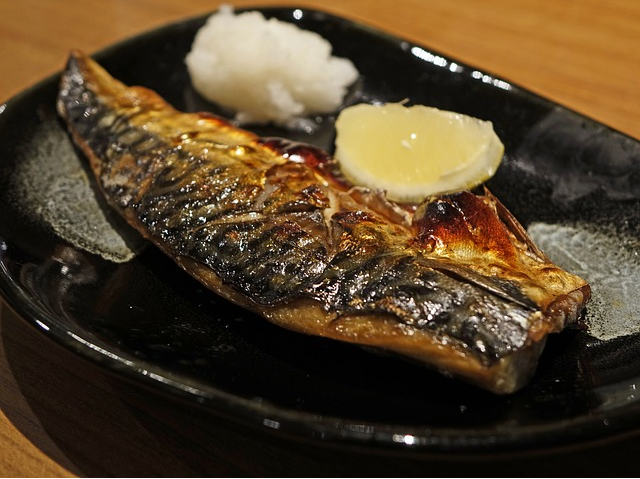 Mackerel Can Minimize Pain and Inflammation Due to Arthritis. Rheumatoid arthritis (RA) is an inflammatory disorder that affects, but is not limited to, your joints. It occurs when your immune system mistakenly attacks your tissues, causing painful swelling and eventually can lead to bone erosion and joint deformity. Very common, and believed to be the result of genetics, RA affects over 1.3 million Americans, about 75% of which are women (17). In addition to its heart healthy benefits, omega-3 can also be effective at minimizing the effects of rheumatoid arthritis by reducing inflammation. They interfere with leukocytes (immune cells) and cytokines (a certain type of enzyme), which are both play a big role in the body’s inflammatory response (18). Oily fish, such as mackerel, have also been known to reduce pain and stiffness due to inflammation, and can be considered a good supplement for pain medications (19). Bottom Line: Adding mackerel to your diet can minimize the effects of arthritis and inflammation in your body. There has been a lot of research put into finding out how the brain works and what affects it, both in cognition and common mental illnesses. Over time, more studies have begun to show that conditions such as schizophrenia and bipolar disorder may be more likely the result of a dietary deficiency rather than a genetic issue (20). Through various studies, fish oil (particularly the omega-3 fatty acid, DHA) has been found to reduce the risk of depression, suicide, and schizophrenia (21). It is essential for brain development in infants and remains fundamental throughout your lifespan. B vitamins are also essential to brain function, and electrolytes aid in the electrical activity within the brain and nervous system. Both of these are also found in fish, such as mackerel (22). Another major brain ailment that has received much attention is Alzheimer’s disease. The precise cause of Alzheimer’s, as well as other forms of dementia, is still virtually unknown, but is thought to be a combination of genetic, lifestyle, and environmental factors over a period of time. The disease damages and destroys the brain’s cells, which leads to brain shrinkage. It begins to affect normal brain activity, such as memory, reasoning, judgment, and personality (23). There has not yet been a cure found for Alzheimer’s disease. However, it has been found that changing your diet can potentially reduce your risk of developing the disease. The MIND (Mediterranean-DASH Intervention for Neurodegenerative Delay) diet, developed by Martha Clare Morris, PhD, has been shown to help slow the rate of cognitive decline. Participants who closely followed the diet found that they had the mental clarity of a person 7.5 years younger. Through the MIND diet, it is recommended that you add at least one serving of fish to your diet per week, due to its omega-3 fatty acid content. Bottom Line: By adding oily fish, like mackerel, to your regular diet, you can reduce your risk of developing many brain-related conditions and diseases. We are always looking for ways to lose excess fat, and there are many fad diets on the market that promise they will help. Diets can fluctuate and are only good for a certain length of time, rendering them ineffective in the long term. The best choice, if you are looking to shed some extra pounds, it to make a lifestyle change when it comes to what you eat, and including fish (like mackerel) in your diet can help you make that first step. In order to effectively lose weight, you need to burn more calories than you take in. Combined with exercise and overall healthy eating, adding mackerel to your diet can significantly decrease your body fat. By switching one of your usual meats with mackerel, you can cut down on your calories and saturated fat intake. Be sure to prepare your fish in a healthy way, opting for grilling or baking, rather than frying (24). There have also been studies that show the effect that omega-3 fatty acids have on burning fat. High levels of omega-3’s have been found to decrease fat cell size, which can help you cut down on belly flab. They also appear to suppress your appetite, causing you to eat less as you’re not hungry, and boost your metabolism (25). Bottom Line: Substituting mackerel for higher fat-content foods can help you to cut calories and lose weight. Protein is essential to our body’s function and growth. It is involved with cellular and muscular health, as well as aids in the production and functioning of enzymes. With a balanced diet, rich in protein, you will have a strong immune system, healthy hair, and proper fluid balance in your body. Responsible for the formation, regulation, repair, and protection of the body, protein is a necessity in our diets. Without proper protein intake, you are at risk of fluid retention and shrinkage of muscular tissue. Your daily food consumption should contain adequate amounts of protein, as your body does not store it. The daily recommended amount varies depending on your individual health and age. However, 2-3 servings of protein-rich foods (such as meat and dairy) per day is adequate for most adults to meet the requirement (26). Mackerel is a great option for getting your protein, with amounts varying between 21-80 grams per fillet, depending on the type of mackerel (27). Bottom Line: Choosing mackerel, over other meat options, as a protein source ensures you meet the daily recommended dosage without taking in the extra fat and calories. Electrolytes, which include calcium, magnesium, sodium, and potassium, are essential for life. They help to regulate the electrical processes in our bodies, which include nerve and muscle function, hydration, and blood pH levels. We lose electrolytes every time we exercise or participate in physical activity. These need to be replenished, ensuring they remain in balance within our bodies. When the levels of electrolytes are out of balance, you can experience symptoms such as muscle twitching, fatigue, changes in blood pressure, and irregular heartbeat (28). Imbalances are very common, especially low potassium and high sodium. With a proper diet, you can ensure your electrolyte levels remain in balance. Include dairy (for calcium), fruits and vegetables (for potassium), and oily fish (for magnesium) (29). Bottom Line: Mackerel can help keep your electrolyte levels in balance, as it helps you to meet your daily requirement of 400 milligrams of magnesium. Vitamin B-12 (cobalamin) is often referred to as the energy vitamin, but it is also essential for red blood cell and DNA formation, and neurological function. When not taken as a supplement, it is only found in animal products, such as eggs, meat, and dairy. While up to 15% of people don’t get enough B-12, there are people who are more at risk for a deficiency, including vegetarians (since they don’t eat animal products) and people over the age of 50 (because of decreased stomach acid, which aids in B-12 absorption). Early symptoms include fatigue, including feeling foggy, and weakness. Left unchecked, you can start to experience more serious side effects, like numbness and depression (30). It is recommended that you receive about 2.4 micrograms of vitamin B-12 (for most healthy adults) per day. Fish, such as mackerel, is the best choice for receiving your daily requirement of B-12, as it provides over 100% of your allowance in just one serving (31). Bottom Line: Avoid a vitamin B-12 deficiency by including mackerel on your plate daily. Selenium is an essential mineral that should be included in our diets. There are many benefits that result from adequate selenium intake. You can experience boosted immunity, as it counteracts the development of viruses. It regulates thyroid function by aiding in the production of thyroid hormones. There have even been studies showing that selenium can help prevent common cancers with its antioxidant properties (32). A deficiency can leave you susceptible to various illnesses, and has even been known to negatively affect male fertility. While low levels of selenium are rare amongst most Americans, there are certain groups of people who may be more likely to experience the effects of a deficiency. People who are undergoing kidney dialysis and living with HIV/AIDS are amongst these, as they may experience dietary restrictions and malabsorption (respectively) (33). It is recommended that most adults intake at least 55 micrograms of selenium per day, according to the USDA. Oily fish, such as salmon and mackerel, as well as nuts and eggs, are ideal choices as they provide the majority of your daily recommended amount. Bottom Line: Experience boosted immunity by eating more fish like mackerel. Free radicals are produced constantly in the body, as a response to environmental toxins and energy production. They are incomplete molecules, missing electrons that are responsible for biological oxidation. They are known to attack other molecules in order to “complete” them. They steal electrons from proteins in your body which can negatively affect your DNA, by breaking open or altering its structure, and cells. This leaves your cells prone to oxidative damage, which can cause them to become brittle, and eventually fall apart and die (34). Antioxidants have been found to be able to prevent the effect that free radicals have on the body. They help to “oxidize” these molecules by donating electrons and breaking the free radical chain without becoming free radicals themselves. Coenzyme Q10 (CoQ10) is one of these powerful antioxidants, and it is found throughout every cell in the body. It assists in helping the body turn fats and other substances into usable energy. Also, with its antioxidant properties, it is thought to help prevent heart disease and cancer, as well as reduce the effects of aging (35). 30 to 200 milligrams are recommended daily for most adults. While you can get CoQ10 through supplements, it is better to get it through your food intake. It is fat soluble, so, as a supplement, it should be taken with a meal that contains fat so it can be absorbed (36). Mackerel is an excellent choice for obtaining CoQ10, as it provides about 43 mg/kg in general, and already contains (healthy) fat to help you absorb it (37). Bottom Line: Mackerel can help reduce the effects of aging and can prevent common diseases, such as heart disease and cancer, thanks to the antioxidant, coenzyme Q10. Mackerel offers many nutritious properties that can help combat your risk of common cancers. CoQ10 (an antioxidant) helps eliminate cancerous agents from afflicted cells. Omega-3 fatty acids (like DHA and EPA) can help prevent breast and colorectal cancers. Oily fish also contain good amounts of vitamin B12 and selenium, which have cancer fighting properties (38). There have been extensive studies showing the effect that regular mackerel consumption has on reducing the risk of developing breast cancer. The fatty acids (DHA and EPA) found in mackerel, and other oily fish, have been shown to hinder production of breast cancer cells. They also reduce mammary gland density, which, in turn, reduces tumor development. Fatty acids have also aided in cancer treatment, as they augment the therapeutic effects of chemotherapy drugs (39). Bottom Line: Increasing the amount of mackerel eaten as a part of your regular diet can reduce your risk of common cancers. Vitamin E is a key vitamin for keeping your eyes and skin healthy, as well as making sure your immune system is working properly. It has many antioxidant properties, helping to protect the body against free radical damage and reduce the effects of aging (40). While many people take vitamin E as a supplement, this is not recommended. There have been known side effects associated with prolonged vitamin E supplement usage. These include the risk of prostate cancer in men, congenital heart defects in pregnant women, and stroke (41). The best way to get your recommended 15 milligrams a day is through your food. As vitamin E is fat soluble, like CoQ10, mackerel is a good choice, providing about 15% of your daily minimum recommendation (42). Bottom Line: Eating mackerel can help keep your skin and eyes healthy and looking young. While many fatty fish can be beneficial to include in the pregnant woman’s diet, it is not recommended that she choose mackerel, especially king mackerel. It is a healthier alternative to other fattier meats, but poses a risk due to high levels of methyl mercury. Consumed in large quantities, it can have an adverse effect on the fetus’s nervous system development (43). When selecting fresh mackerel, there are certain things you should look for. In appearance, it should have bright, clear eyes, and shiny scales. It should also not have a strong odor. You will also want good quality, so look for fillets or steaks that have the softest, most translucent meat (44). Fresh mackerel is available throughout the year. It is recommended that you cook it, either by grilling or broiling, as soon as you buy it. You can also buy it canned. If you choose this option, you may find that the smaller cans (often packaged with olive oil) may be milder than the larger ones (45). There are many great ways to add mackerel to your diet, using it both fresh and smoked. Be sure to check out these quick, easy recipes. With minimal prep and ingredients, this recipe is a great choice for an easy dinner. Rinse your fresh mackerel fillets (about 8 of them, depending on how many people you are feeding) and pat dry, removing any stray bones, and place them in a shallow dish. In a small bowl, whisk together the juice of one lemon, 4 tablespoons of olive oil, and 3 crushed garlic cloves, adding salt and pepper to taste. Pour over your fillets, ensuring they are coated on both sides. Cover and allow to marinate for 15-20 minutes. Heat your grill or griddle pan (about medium-high heat) and cook your fillets for about 2-3 minutes on each side. Top with chopped parsley and lemon wedges, and serve with your choice of sides. In America, fish for breakfast may sound strange, but this recipe is sure to change your mind and the way you think of your morning toast. Toast 2 slices of bread to your preferred darkness. While the bread is toasting, remove the pit and skin from half of an avocado, and the skin and bones of a smoked mackerel fillet. Break the mackerel into chunks. When your toast is ready, use a fork to smash and spread your avocado between the two pieces. Top with your chunks of mackerel and slices of spring onion, and season with lime juice and pepper (if desired). An easy and healthy meal, this recipe is sure to win you over. Preheat your oven to 400°F. Clean your sweet potato and pierce it with a knife. Rub olive oil and salt into the skin, and place it in the oven, allowing it to bake until it is softened while the skin is slightly crispy. Allow to cool for about 30-45 minutes. Slice your potato in half and scoop out the middle (making a boat) into a separate bowl. Break up a smoked mackerel fillet into chunks and add to your potato in the bowl, mixing it together. Place the mixture back into your potato boats, and allow to bake for another 15 minutes, or so. Looking to add some Asian flair to your table? Check out this recipe. Cook about a cup of sushi rice according to the directed instructions, adding about 3/4 cup of soy beans for the last 3 minutes of cooking time. In a separate bowl, mix together 2/3 cup of teriyaki sauce, the zest and juice of a lemon, and a crushed garlic clove. Remove the skin from about 4 smoked mackerel fillets and brush the mixture over each one, placing them in a non-stick pan. Cook for 1-2 minutes on each side over medium-high heat. Distribute the rice amongst your serving bowls and top each with a mackerel fillet. Spoon your remaining sauce mixture over the rice and fish, and top with shredded spring onion. Serve with a bit of wasabi paste, if desired. Eaten as a side or as a sandwich, these mackerel patties are a great choice for any get-together. Boil about a pound of potatoes (peeled and diced), then reduce heat and simmer for about 15 minutes. Drain and mash the potatoes, mixing in chopped fresh parsley, a tablespoon of lemon juice, and a ½ teaspoon of chili flakes. Break up smoked mackerel fillets, until you have about a cup’s worth, and add it to your potato mixture, adding a heaping tablespoon of flour and mixing everything thoroughly. Take portions of the mixture and shape into patties (whatever size you prefer). Chill the patties for at least 30 minutes. Add oil to your pan. Remove the cakes from the fridge and fry them over medium heat for about 7 minutes on each side, or until golden brown. Serve on grilled buns (fixed up as you like) or alone with tartar sauce. Full of flavor, this dip is a favorite for every Super Bowl and tailgate party. Skin and shred about ¾ of a cup’s worth of smoked mackerel. In a bowl, mix together the fish, a 5-ounce container of sour cream, and finely chopped spring onion, then stir in 4 teaspoons of horseradish. Chill and serve with veggies or crackers. Make your salad a little more interesting with this recipe. Boil about a cup of water, then pour over about ¾ cup of couscous. Cover for 10 minutes, then fluff with a fork. While the couscous sits, prepare the dressing by mixing together the juice of one orange, 3 tablespoons of red wine vinegar, 1 teaspoon of sugar, and 3 tablespoons of olive oil. Season as desired. Chop 3.5 ounces of watercress (or any green leaf vegetable you choose), and flake 8.5 ounces of smoked mackerel. Mix all ingredients together and enjoy at home or on the go. Looking for a way to warm up on a cold day? This stew recipe is sure to do the trick. Combine a 15-ounce can of mackerel (undrained), a can of tomato soup, sliced potatoes and onion, and red pepper flakes in a stock pot, adding just enough water to cover everything. Bring it to a boil, then reduce heat and allow to simmer for about 30 minutes, or until the potatoes are tender. Ladle out a bowlful, cracking an egg over the stew (if desired), and enjoy.